Much to my dismay, the Telegraph stopped compiling animal photos of the week. They did, at least, create a photos of the year gallery. 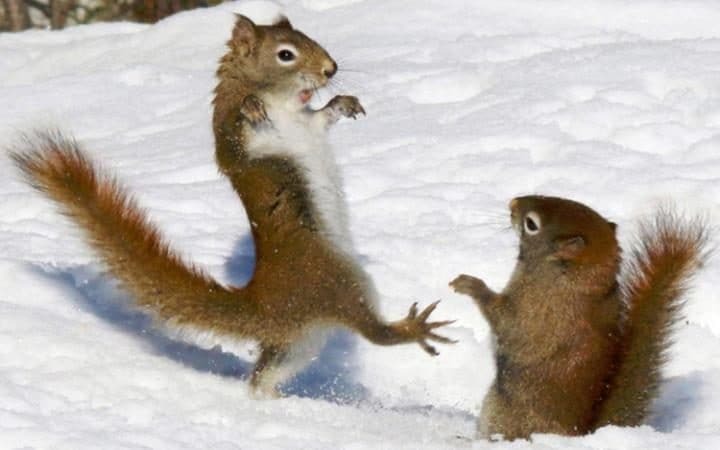 A red squirrel adopts a ninja-like pose reminiscent of the 80s blockbuster&nbsp;Karate Kid as he squares up to another rodent during a fight over some seeds that had been thrown onto the snow in Algonquin Provincial Park in Ontario, Canada. Over the last decade, Dan Kahan, a psychologist at Yale University, has been studying a phenomenon he calls “cultural cognition,” or how values shape perception of risk and policy beliefs. One of his insights is that people often engage in something called “identity-protective cognition.” They process information in a way that protects their idea of themselves. Incongruous information is discarded, and supporting information is eagerly retained. Our memory actually ends up skewed: we are better able to process and recall the facts that we are motivated to process and recall, while conveniently forgetting those that we would prefer weren’t true. The Harvard psychologist Steven Pinker, one of several to nominate Kahan for this list, said that his theory is best called “political and intellectual tribalism.” Like seeks like, and like affirms like—and people gravitate to the intellectually similar others, even when all of their actions should rightly set off alarm bells. Yep. This pretty much nails it as well as anything for explaining Trump. Because it is very, very hard, both policy-wise and the politics (i.e., taking health care away from 20 million people is never going to look good). The trade-off here is sharp. One way Republicans could achieve the same coverage levels at a lower cost is to allow insurers to offer stingier, sparer products. But those products would mean more people lose access to doctors they were happy with, and more people end up in plans whose deductibles they can’t actually afford. That’s bad politics. Good politics is doing what Trump did and promising that voters “can have their doctors, they can have plans, they can have everything.” The problem is that’s a promise that zero of the GOP replacement plans keep. The same is true on coverage. Republicans could decide that their Obamacare replacement will be cheaper because it will cover fewer people. And, to be fair, there are a number of Republican replacement ideas floating around, and all of them would leave millions uninsured compared with Obamacare. But taking away insurance people already have is — as the Obama administration already learned — wildly, wildly unpopular. And Republicans know that too. On Monday, Kellyanne Conway, one of Trump’s top advisers, said, “We don’t want anyone who currently has insurance not to have insurance” — a principle that disqualifies every Republican repeal plan, including Trump’s own. But Obamacare’s goals were, at least, popular. It’s not clear that the Republican Party’s goals actually are popular. Do people abstractly support fewer Americans having health insurance? Or more high-deductible plans? Or changes to the tax code that would begin to weaken the link between employers and health coverage? This is, in reality, why Republicans are so cagey about their replacement plans: They’re not sure the country will like what they offer. As long as you’re working with private insurance, you run into what I call the iron law of private sector health reform (catchy, right? ): You can have any two of good insurance, low premiums and deductibles, or low taxes. But you can’t have all three. From the standpoint of the most ideologically committed elements of the conservative base, destroying Obamacare was always the most salient pledge. Republican rhetoric treated the law as an existential threat to American freedom — the worst thing since slavery, as incoming Trump cabinet member Ben Carson put it. But from the standpoint of the electorate as a whole, the pledge to replace it with “something terrific,” as Trump put it, mattered just as much. A large number of Trump voters who get coverage through Obamacare “simply felt Trump couldn’t repeal a law that had done so much good for them,” reports Sarah Kliff, who spoke with many of them. But any plan to replace Obamacare with something “terrific,” or even something almost as good as Obamacare, will violate conservative dogma. There’s no way around this. Despite the apparent complexity of the issue, it’s a very simple problem of resource allocation. In a free-market system, tens of millions of Americans will not be able to afford medical care because the cost of their treatment exceeds their income, either because they’re too poor, or because they’re too sick. A Kaiser Family Foundation analysis finds that 52 million Americans under the age of 65 have preexisting conditions that would make it impossible for them to purchase health insurance in the individual market that existed before Obamacare. An insurance-industry study from 2008 found that 13 percent of people who applied for coverage in the individual market were rejected — a figure that doesn’t even count the 34 percent of people who had to buy policies that excluded coverage of treatments for their preexisting conditions, let alone those who didn’t even bother applying because they knew they couldn’t afford it. But even this step has proven extremely tricky. If Republicans repeal Obamacare without creating a replacement, insurers will have little reason to stay in the marketplace. They’ll start canceling plans immediately, and the news will be filled with stories of Americans being thrown off their medication and, in some very real cases, dying. Repeal-and-delay will actually require taking additional action to prevent a meltdown. The Republican Party is fracturing around Obamacare in ways we haven’t seen before. This is happening for a simple reason: It’s really, really hard to end health insurance benefits for 20 million Americans, especially when you don’t have a plan for what comes next. I still think repeal is the most likely outcome of this debate — it just doesn’t seen nearly as certain possibility as it did a month ago. I’ve spent seven years covering the Affordable Care Act, and right now I honestly don’t know what will happen next. It is reminiscent of the early days of Democrats’ health care debate, when we legitimately did not know if the party would succeed in passing the largest expansion of coverage in decades. We don’t know, for example, how seriously Republican senators oppose repeal and delay — whether these are some initial protests that will die down, or if they are serious about voting against the approach. We don’t know if Obamacare repeal will face protest from the right-wing House Freedom Caucus, which doesn’t like the idea of putting off Obamacare repeal at all. Now, surely Republicans will come up with something they label “repeal” but it’s really not too much of a stretch to imagine something like what Indiana did with replacing “Common Core” with a new set of standards that are still basically Common Core. That said, I wouldn’t put it past them to just take health insurance away from 20 million Americans. One this is certain– the current situation is incredibly uncertain and could go in any number of a possible ways. That’s why repeal and delay was the best chance to destroy Obamacare. The gamble was that, by blowing up the health care system on a fuse, Republicans could pressure Senate Democrats into going along with a Republican friendly replacement. The details might be unpopular, but coerced Democratic support might give it cover. But this plan only works if 50 Senate Republicans are willing to gamble that they can hold the one-seventh of the economy consumed by health care as a hostage and force a bunch of Democrats to go along. If that gamble fails, the ruin could easily trigger a backlash against the majority party. Apparently not enough Senate Republicans are willing to roll the dice. If this holds, Obamacare, or something substantially similar, is probably going to survive.